1. "Provided I become a Buddha, if in my Buddha-land there should be either hell, or the animal state of existence, or the realm of hungry ghosts, then may I not attain enlightenment. 2. "Provided I become a Buddha, if the beings born in my Buddha-land should retrogress into the three evil realms, then may I not attain enlightenment. 3. 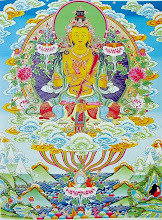 "Provided I become a Buddha, if the beings born in my Buddha-land are not all of the color of genuine gold, then may I not attain enlightenment. 4. "Provided I become a Buddha, if the beings who are born in my land are not all of identical appearance, without any distinction of noble looks or ugliness, then may I not attain enlightenment. 5. 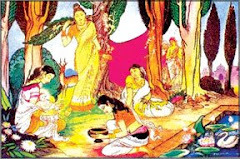 "Provided I become a Buddha, if the beings born in my land are not possessed of the supernormal ability to remember their previous lives, and the ability to know the events of of a hundred thousand nayuta years of kalpas in the past, then may I not attain enlightenment. 6. "Provided I become a Buddha, if the beings who are born in my land do not possess of the divine-eye, which can see a hundred thousand nayuta of Buddha-lands, then may I not attain enlightenment. 8. "Provided I become a Buddha, if the beings of my land do not all possess the intuitive-mind, which knows the thoughts of all beings of a hundred thousand kotis of nayuta of Buddha-lands, then may I not attain enlightenment. 9. "Provided I become a Buddha, if the beings of my land do not all possess the heavenly -step, which can of one thought travel over a hundred thousand kotis of nayuta of Buddha-countries in the shortest fraction of a moment, then may I not attain enlightenment. 10. "Provided I become a Buddha, if there should arise in the minds of any beings in my land the idea of selfishness and covetous thoughts, even with regard to their own bodies, then may I not attain enlightenment. 11. "Provided I become a Buddha, if the beings of my land do not all firmly abide in a concentrated state of meditation and equanimity (samadhi) until they have reached nirvana, then may I not attain enlightenment. 12. "Provided I become a Buddha, if my light is limited in such a way that it cannot illuminate a hundred thousand nayuta of kotis of Buddha-lands, then may I not attain enlightenment. 13. "Provided I become a Buddha, if the length of my life is limited, even to a hundred thousand nayuta of kotis of kalpas, then may I not attain enlightenment. 14. 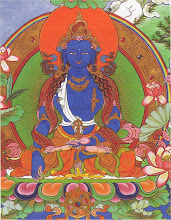 "Provided I become a Buddha, if any being is able to count the number of innumerable pupils in my land -- even if it takes a hundred thousand nayuta of kotis of kalpas for all the beings of three million worlds and the whole triple universe, after becoming Pratyeka-Buddhas, to count that number -- then may I not attain enlightenment. 15. "Provided I become a Buddha, if the lives of the beings in my land are not eternal, except by their own free will whenever they choose to pass away from life, then may I not attain the enlightenment. 16. 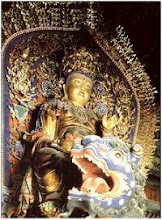 "Provided I become a Buddha, there will be no evil or sinful existence in my land; even its very name will be unknown. Otherwise, may I not attain enlightenment. 17. "Provided I become a Buddha, if the innumerable Buddhas of the worlds of ten quarters do not glorify my name, then may I not attain the enlightenment. 18. 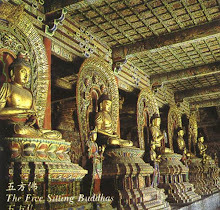 "Provided I become a Buddha, if any sentient being in the ten quarters who hears my name and is thus awakened to the highest faith and aspires toward rebirth in my land, recollects that thought for as few as ten times, that being will be reborn there, with the exception of those who have committed the five grave offenses, or who have blasphemed the Dharma. Otherwise, may I not attain enlightenment. 19. 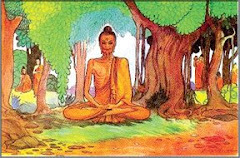 "Provided I become a Buddha, then at the moment of death of any sentient being in the ten quarters who has directed his thoughts towards the Bodhi and has cultivated his stock of various merits with a fervent desire for rebirth in my land, if I do not appear with an assembly of retinue before him, then may I not attain enlightenment. 20. 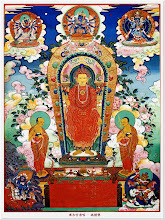 "Provided I become a Buddha, if any sentient being of ten quarters hears my name and then constantly longs for my land and cultivates various essential merits for the purpose of realizing his earnest wish to be born in my country, and then fails to attain that wish, then may I not attain enlightenment. 21. "Provided I become a Buddha, if any sentient being in the ten quarters is not endowed with a glorious body perfected with the thirty-two attributes (laksanani) of a great being, then may I not attain enlightenment. 22. 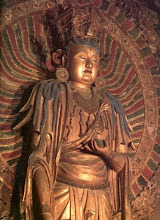 "Provided I become a Buddha, the Bodhisattvas whose activities have surpassed the stage of ordinary beings, who practice the universal virtue of Universal Worthy Boddhisatva, and who come to be born in my land will be subject to that one birth only, and then will become Buddha-elect (ekajatipratibuddhas), with the exception of those who, by their own free will, wish to remain in the stage of Bodhisattvahood to serve the Buddhas of ten quarters for the sake of delivering various beings. 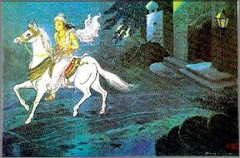 Then they will wear the armor of their vows and will travel to all worlds, performing their Bodhisattva's duties and accumulating their stock of merit, converting the various beings whose numbers are as great as the grains of sand of the River Ganges to the highest perfect knowledge. Otherwise may I not attain enlightenment. 23. "Provided I become a Buddha, if those Bodhisattvas in my land, through the Grace of the Buddha, are not able to serve all the Buddhas throughout the countless nayuta of Buddha-worlds within a less than a moment, then may I not attain the enlightenment. 24. "Provided I become a Buddha, if any Bodhisattva in my land wishes to use his stock of merit to produce any object to be used before the Buddhas, and if such an object does not appear before him to his satisfaction, then may I not attain enlightenment. 25. "Provided I become a Buddha, if Bodhisattvas in my land are not able to preach the law of wisdom to completion, then may I not attain enlightenment. 26. 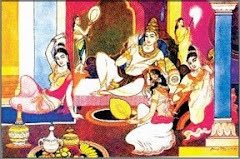 "Provided I become a Buddha, if any Bodhisattva in my land does not possess a golden body as strong as the diamond of Narayana, then may I not attain enlightenment. 27. "Provided I become a Buddha, the heavenly beings and the various properties produced in my land shall all be of supreme beauty and shall abound in boundless quantity, and in an infinity of various forms. If any being therein, even one who even possesses the divine-eye, is able to perceive all the appellations and quantity of such beauties, then may I not attain the enlightenment. 28. 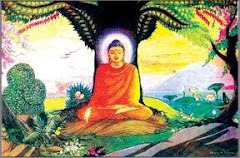 "Provided I become a Buddha, if any Bodhisattva of my land who possesses even the slightest stock of merit does not perceive the boundless shining beauty of the Bodhi-trees of my sanctuary, their height being at least four million miles, then may I not attain enlightenment. 29. "Provided I become a Buddha, if the Bodhisattvas of my land do not all possess the wisdom of eloquent oration after having read, recited, and observed the Dharma of the Sutras, then may I not attain the enlightenment. 30. "Provided I become a Buddha, if the Bodhisattvas of my land are limited in the wisdom of their oration, then may I not attain enlightenment. 31. 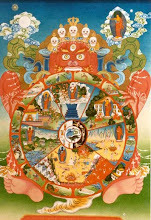 "When I have obtained the Buddhahood, if my land is not so reflective and raidant that it reflects the miniatures of the innumerable, inconceivable and boundless Buddha-worlds in all the ten quarters as clearly as one's face is seen in a bright mirror, then may I not attain enlightenment. 32. 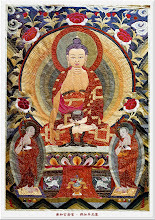 "After I have obtained Buddhahood, there shall be in my land magnificent palaces towering up from the ground to the void, also lakes, winding streams, blossoming trees, and myriad other properties which are compounded of various jewels and thousands of kinds of perfumes, minutely embellished in the most wondrous state, surpassing all heavenly and human worlds. And the scent of perfumes shall thoroughly pervade the worlds of ten quarters in such a way that when Bodhisattvas smell them, their minds are directed to Bodhi. Otherwise, may I not attain enlightenment. 33. 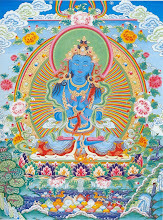 "When I obtain the Buddhahood, if the body of any sentient being in the boundless and inconceivable Buddha-worlds in any of the ten quarters is touched by the rays of my splendor, and if that being's body and mind do not then become gentle and peaceful, in a state that is far more sublime than those of the gods and men, then may I not attain enlightenment. 34. 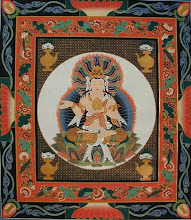 "When I obtain Buddhahood, if the beings of boundless and inconceivable Buddha-worlds do not attain the "Endurance of Nirvanic Life" (ajatah sarvadharmah) of Bodhisattva, and the deep knowledge of "Adharanamudro" (or dharani) afterhearing my name, then may I not attain enlightenment. 35. "When I obtain Buddhahood, women in boundless and inconceivable Buddha-worlds across the ten quarters will hear my name and will thereby been awakened in faith and joyful aspiration. Turning their minds towards Bodhi, they will dislike their own female lives, and then, when they are born again, in their next life they will be reborn in male bodies. Otherwise may I not attain enlightenment. 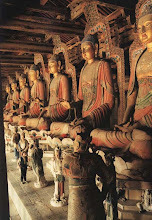 36.When I obtain Buddhahood, the Bodhisattvas of boundless and inconceivable Buddha-worlds across the ten quarters, having heard my name, after their death [in their next life] will still continue their Bodhisattva-duty until they have obtained Buddhahood. Otherwise, may I not attain enlightenment. 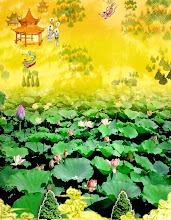 37.When I obtain Buddhahood, the heavenly beings of the boundless and inconceivable Buddha-worlds across the ten quarters, having heard my name, will worship me with prostrate reverence, and will joyfully and faithfully perform their Bodhisattva-duty, and will be honored by gods and men. Otherwise, may I not attain enlightenment. 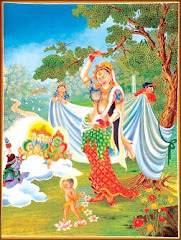 38.When I obtain the Buddhahood, the heavenly beings of my land, should they desire a garment, will be able to perceive themselves, as quick as thought, covered by apparitionally produced costumes, excellent to their satisfaction, worthy to be praised by the Buddha, without the work of sewing, washing, dying, and so on. Otherwise, may I not attain enlightenment. 39. 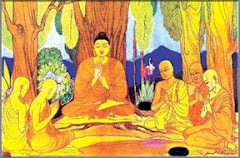 "When I attain the Buddhahood, if the heavenly beings of my land do not enjoy happiness as great as that of the holy bhikkhus, then may I not attain enlightenment. 40. 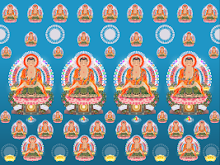 "When I attain Buddhahood, if the Bodhisattvas of my land wish to see the boundless, holy, pure Buddha-worlds of the ten quarters, they will at once behold them from the jewel-trees as though their faces were being reflected in a highly burnished, brilliant mirror. Otherwise, may I not attain the enlightenment. 41. "When I attain the Buddhahood, if the Bodhisattvas of other worlds, after having heard my name, suffer from any diminution in the functional powers and are not endowed with all sense-organs in completion before reaching the Buddhahood, then may I not attain enlightenment. 42. "When I obtain the Buddhahood, if the Bodhisattvas in other Buddha-lands whohear my name do not all attain, in one moment of thought, the pure samadhi of emancipation from which they could serve innumerable and inconceivable number of Buddhas [Tathagatas], or if their of their samadhi should come to an end meanwhile, then may I not attain enlightenment. 43. "After I have obtained the Buddhahood, if any Bodhisattva of another land hears my name, that Bodhisattva will, after death, be reborn as a member of a noble family if he or she so desires. Otherwise, may I not attain enlightenment. 44. 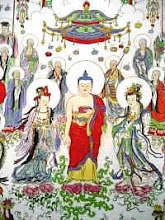 "When I obtain the Buddhahood, the Bodhisattvas of other lands, having heard my name, will all obtain a combination of full virtues and will joyfully perform their Bodhisattva-duty. Otherwise, may I not attain enlightenment. 45. "When I have obtain Buddhahood, all Bodhisattvas of other lands who hear my name will obtain the samantanugata (the thoroughly and equal samadhi in a fixed state of meditation). Through that samadhi, they will see innumerable and inconceivable Buddhas constantly until they have obtained the Buddhahood. Otherwise may I forbear from obtaining enlightenment. 46. "When I obtain Buddhahood, the Bodhisattvas of my land shall be able to hear the Teaching of the Dharma whenever they desire. (The voices of teaching will present themselves naturally to their ears). Otherwise may I refrain from attaining enlightenment. 47. "When I obtain Buddhahood, if Bodhisattvas of other lands, after having heard my name, do not immediately reach the state of never turning back from Bodhi, then I will refrain from attaining enlightenment. 48. "When I have obtained Buddhahood, if Bodhisattvas of other lands who hear my name, do not reach the first, second, and third degrees of Dharma-endurance immediately, or if they turn back from the Buddha Dharma, then I will refrain from attaining enlightenment.